I was listening to the news the other day when I heard yet another prediction of impending gloom, doom and despair. I thought about how surrounded we are by words and thoughts that fuel our fear, worry and anxiety. God's Word says in 2 Timothy 1:7,"For God did not give us a spirit of timidity (of cowardice, of craven and cringing and fawning fear), but [He has given us a spirit] of power and of love and of calm and well-balanced mind and discipline and self-control." The enemy wants to intimidate, manipulate and control us through fear. In contrast, God enables us to be courageous, powerful, loving, calm, well balanced, disciplined and self controlled even in the midst of our chaotic world. Another thing that I noticed is that we are surrounded by words and thoughts that feed a victim mentality, that fuel feelings of hopelessness and despair. We are told that we can never get ahead, never overcome, that our race, or our gender, or that awful thing that happened to us in our past will forever be a millstone around our neck keeping us from wholeness and healing, happiness and success. This too, becomes a weapon that the enemy uses to keep us down, to keep us a cowering, whimpering victim instead of a strong, determined overcomer. Lastly, I noticed that the we are surrounded by words that fuel division and strife. Black versus white, democrat versus republican, men versus women. The enemy knows that a house divided against itself cannot stand. I think he's standing back in glee watching us bite and devour one another. These things ought not to be! We might not be able to control the disunity that abounds in our society as a whole, but we can refuse to let it get a foothold in our own hearts, in our own homes, in our own churches. God's Word admonishes us to not let satan get an advantage over us by being ignorant of his wiles and intentions. 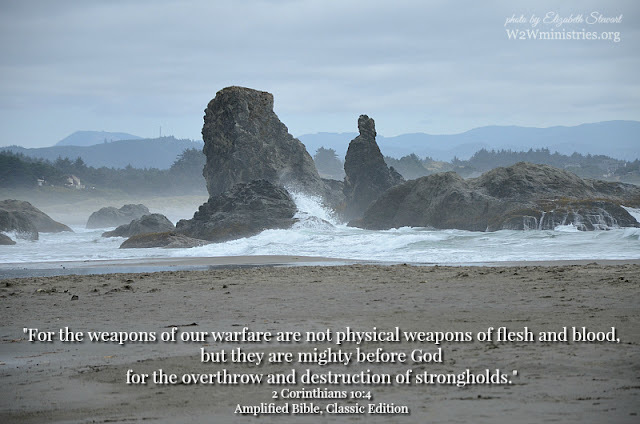 The good news is that God has given us every spiritual weapon we need to overthrow and destroy every one of the weapons the enemy uses against us. We don't have to just stand there and take whatever satan throws at us. God has strengthened and reinforced us within with His own Holy Spirit! "May He grant you out of the rich treasury of His glory to be strengthened and reinforced with mighty power in the inner man by the [Holy] Spirit [Himself indwelling your innermost being and personality]." Ephesians 3:16 Amplified Bible, Classic Edition I think it's time for us to form our own resist movement! "So be subject to God. Resist the devil [stand firm against him], and he will flee from you." James 4:7 Amplified Bible, Classic Edition Don't be overwhelmed by fear, worry and anxiety! Don't remain a victim, full of hopelessness and despair! Don't be consumed by division, strife, unforgiveness, offenses and bitterness! RESIST! God's weapons combined with your willingness to stand up and resist the enemy and all of his lies, tricks and schemes is a winning combination!